 GLFrontier for AROS just hit the AROS Archives. 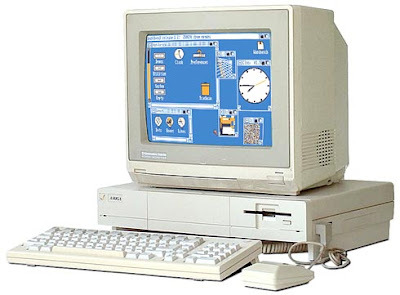 Do you remember the Commodore Amiga? 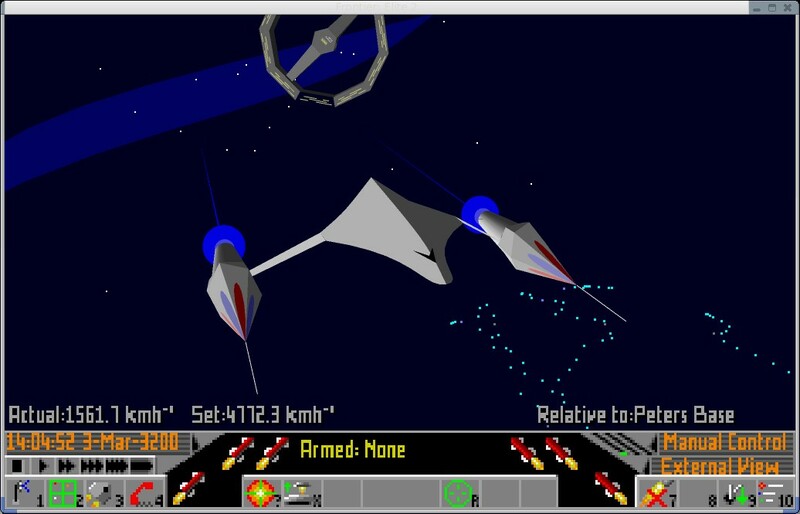 While there are a few emulation alternatives for running the old m68000 software on all kinds of machines, I’m going to talk about AROS today. AROS is to AmigaDOS what Wine is to Windows. Once it became clear that Commodore was going to die, and that AmigaDOS and the Amiga were lost a few brave people decided that they had to take matters into their own hands. Sadly there was lots of in fighting, a tradition of the comp.sys.amiga.advocacy news group where some people get too tied into little details and let little things (like the rise of Microsoft Windows) pass them by. At any rate, Aaron Digulla knuckled down, and start to write a bug for bug clone of AmigaDOS 3.1 in C to run on the IBM PC. The result of which is AROS. It currently will either run hosted on Linux/NetBSD or natively on the i386. There is a port to the Amd64 undergoing right now. AROS even has SDL support. So this got me thinking..
What if I were to remove all the OpenGL calls from GLFrontier, and ran it as a strictly 2d app on AROS? So I took the first step, and I trimmed out the OpenGL support from Tom’s fix of Frontier, so it’s completely SDL 2d friendly, and cross compiled it to AROS. I built the first pass on MinGW, and got frame rates of upwards of 1000 on Vista 64! Now for the fun part of building an AROS version. While there is now a native GCC for AROS it cannot compile the assembly listing from GLFrontier.. I suspect it’s a heap overflow. This means you have to cross compile. I have cygwin installed in a Windows 2000 VM I use with Virtual PC 2007. I’m not sure if cygwin installs on Vista, let alone Vista 64, however I do suspect it MAY have issues… I keep my dev stuff in a VM so I can move it around without losing my settings. Done! 539337 bytes and 759 relocations. *REMEMBER as68k has to actually run on the host machine, so it needs to be native, you cannot use a cross compiler for that. However you do cross compile it’s output. Naturally you’ll now want to run your exe! To get the network running you have to go into Extras:Networking/Stacks/AROSTCP/db and edit static-routes, netbd-myhost, and interfaces. You can also try to ping a website, but you might not get any return packets because of QEMU’s built in firewall. You should at least see the ip address for the site you ping. Or ping 10.0.2.2 to make sure you network is communicating with Qemu. Now for the final moment, put your exe on a web server, and simply use wget to get it! I’d recommend zipping up your work directory, so it includes the ‘bin’ file, and the structure that GLFrontier expects. I like the zip file format as WinAROS includes unzip. It’s that easy! Now you can either ‘cd’ or click on your frontier, and away it should go! The video is a bit wonky in that it seems to only work in 8 bit or 24bit depths. So far I’ve only tested this in WinArosDeveloper. * of GL display lists to draw (in list order). * Draw this crap starting from biggest value znodes. Simply put vMac is a quick & fast Mac Plus emulator. That being said, it will emulate a 68000 cpu with 4 (yes, FOUR) megabytes of ram. Now you will need a ROM from a plus Macintosh in order to run this. I actually did own a plus (it made a good foot rest), but before I moved I ripped the ROM, and trashed it. vMac started in the late 1990’s but has been largely abandoned. But not to worry, this is where mini vMac stepped in, and took over the torch as it were. The good news is that it’s small, and portable so you can pick this up for several platforms. And yes, there is a version for PowerPC Macs so you can run some super ancient software with system 6 and prior on System 8/9 PowerMacs. to get up & running quickly. If you still have legacy 400k, 800k floppies you will require a real Mac to read them. They are formatted in a different method that a PC cannot read. However this changed with the high density drives (super drivers they were called) which a PC can at least read/write raw disk images of them. Ok with mini vMac, your rom, a hard disk file & the system 7 boot disk you should have enough to have a booting instance. It should be about that simple. I happen to love this game Captain Blood, and I found a copy for the Macintosh and using HFVExplorer I just move it into my disk file, unstuff & run. The whole point is that this ancient game bypasses the toolbox for video calls and will crash on the Powermac I just bought, however it’ll run fine in emulation. Next up we’ll cover the PowerMac emulation…! (Image from Wikipedia) I never took a picture of mine. 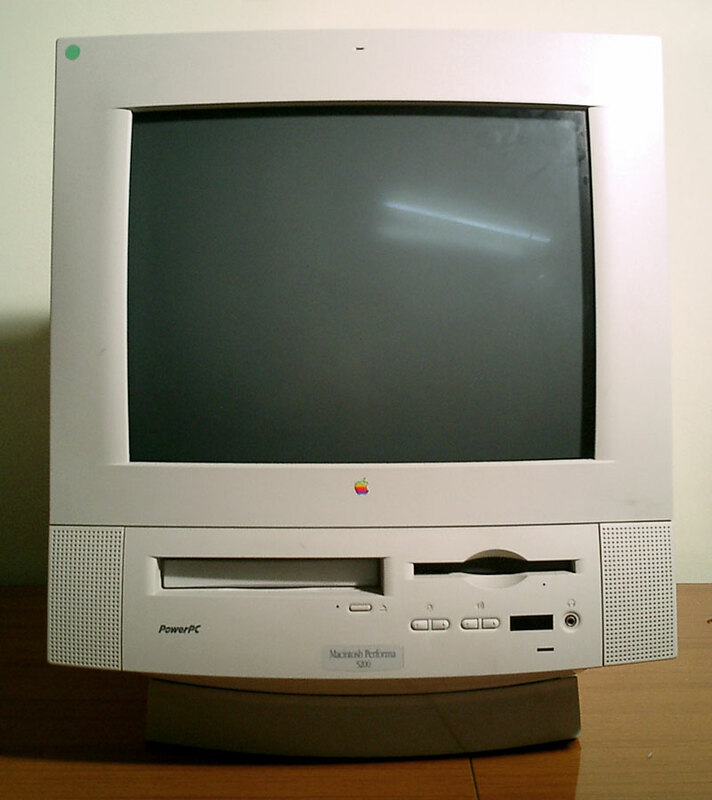 I’ll throw out a little tidbit about the Power Macintosh 5400/120, otherwise known as the Performa 200. If you do not have any Mac OS CD’s this will be *VERY* hard to get going with nothing. The good news is that there are boot floppies available out there. The bad news is that they are encoded in a method in which you’ll have to get access to a working Mac. If there was somewhere I could post these files forever I would. Now it’s a diskcopy 6.4 image. Which you’ll need a Mac. I was able to finagle one from a Mac, however I’m wondering now if it’s possible to do this via emulation. During this whole resurrect my $12 Mac I’ve come across vMac, Basilisk II & SheepShaver. I plan on doing some serious review, however it is worth noting that while both do run fine, they are actually buggy on weird stuff vs the real iron. From what I gather with the boot disk, you can boot your Mac up, partition & format it, and install this super small bootable System 7.6 onto the hard disk. It will complain about you doing it this way, but it will work, allowing you to get the box up & running somewhat, to let you try some methods of getting the install disk for 7.6 onto your Mac. The System Software 7.5.3 Installer script does not recognize this Macintosh. Please use the original disks that came with your computer. Sadly all information I see is that this thing shipped with 7.5.3 Oh well. I eventually found a boot floppy! If anyone does anything MacOS for a living or is going to play with a Mac you ought to save the whole thing! It’s VERY useful, more so than Apple’s documentation. Anyways I’ve tweaked up a copy of the SIMH PDP-11 to compile and do a small test under MiNT/MacOS. Tomorrow we shall see if it’s usable. So I was building a simple program, and I noticed that -lm (linking in the math library) doesn’t work. Well it appears that MiNT doesn’t have a normal math library, it’s called pml. I guess it’s a “portable math library”? At any rate simply copying the /usr/lib/pml.olb to /usr/lib/m.olb allows you to keep on trucking. Recently I came across a Power Macintosh 5400/120 at a garage sale for the bargain price of $12! I couldn’t believe my luck, for under $20 I had a fully working computer! And it only has 8Mb of ram. MINT back in the day for AtariST’s was a UNIX like layer that ran on top of TOS (The Atari MS-DOS like OS) and provided basic Unix services. With the program aptly called JET (Just Enough TOS), the Macintosh 68000’s can setup a TOS compatible interrupt vector table, and run TOS procedure emulation to run the MINT binaries under MacOS! First you need to disable Virtual Memory… That’s bad. Next it doesn’t support TCP/IP so it’s like being on Unix v6. But it’s fun at any rate. You can find the binaries at my mirror of sra.co.jp here. It includes gcc 2.5.8, and a somewhat basic environment. It does have lots of potential, but the biggest gripe is that 8Mb of ram just isn’t enough to do any serious compiling, and yes it will crash with virtual memory enabled. Also since it is 68000 programs it is running under emulation.. I have to admit that I am tempted to buy some kind of 68000 based Macintosh to run MacMiNT. I know this may not be terribly useful to people, but then again someone has to do something fun/weird on a $12 machine. I fully expect to either get a ‘bigger’ 68000 box, or more ram and run something like simh on it. I can only wonder how usable the PDP11 or the Interdata32 are. And for anyone, like me wants a ‘clear’ program, just because, here is a simple one, just remember to link with -ltermcap. I’m talking about Anonet! it’s an internet style network that is encapsulated over OpenVPN. In early 2005, a few people fed up with the way the Internet was heading, began in earnest to create a large wide area network that was secure and lived in its own space. On this new network anyone would be free to do as they saw fit – roam about, host services, or just be social without fear of being monitored or even worse censored. The first step to bring this network to fruition was to encrypt the information that normally travels across the Internet. What they ended up with is known as anoNet.This network was inspired by MetaNet, another “dark” network on the Internet, that used similar techniques to reach their goals. A few “core” members of anoNet were once a part of MetaNet but due to their strict nature, peering with MetaNet was lost and they became an “island”. anoNet has already surpassed what MetaNet had in membership, and is on its way to being a viable alternative to the “Internet” you currently know, whether you love it or hate it. If you are feeling adventurous check it out. If you are feeling really adventurous you can help; there is still lots to be done. It will run on any platform that runs OpenVPN. I’m using Windows 2000 Pro in a VirtualPC VM. I hang out on the anonet IRC server from time to time ( 1.0.9.1 #anonet) if you are feeling brave, load up openvpn, retreive the client configuration and drop by! If you are feeling real brave, try to become a peer onto the network!